This feature allows a merchant to specify a certain period of time when an order is in a ON HOLD status. Remorse time pauses all orders in your Order Management System (OMS) for n seconds before continuing with the normal flow. 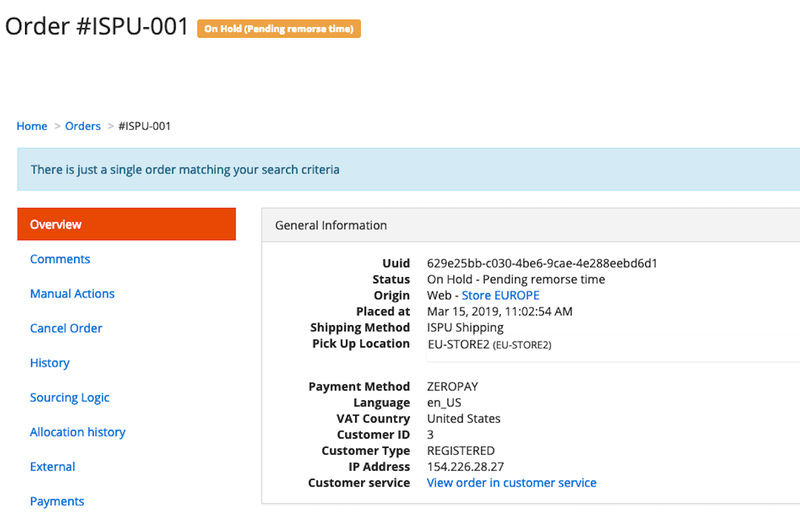 n seconds begins from the order.origin_date attribute that you can find in the magento.sales.order_management.create message. For example, a merchant wants to have some time for a customer to cancel the order due to a mistake in their order. This functionality uses UTC timezone. If an order with an incorrect order.origin_date is placed, this order is in a ON HOLD status until the order.origin_date and its related remorse time are finished. Activate the Remorse time option in your System Integrator (SI) Portal in Config > Global settings > Order. This functionality can only be setup with the time in n seconds where the order needs to remain in an ON HOLD status. Setup Custom details restrictions for this functionality. Specifying this value means that remorse time will only be applied to orders that contain this restriction. This allows you the capability of applying use cases to define a unique remorse time, like for orders with more than n lines. - all: Takes in consideration all days. - excludeWeekends: Only takes in consideration days between Monday-Friday. It is possible to setup a Remorse time (Test) which is only applicable to Test Orders. Testorders are orders which contain Test in any of the Name or Surname fields. There are no restrictions applicable to this functionality. Remorse time can be used with all OMS order types. When a store representative accesses the OMS, a status of ON HOLD with the status reason of PENDING_REMORSE_TIME (while the remorse time is active) appears in the Customer service view. After the remorse time is finished, the status is still ON HOLD while the status reason changes to REMORSE_TIME_COMPLETED. For more information on status changes and the flow of an order, see the Order flow page.